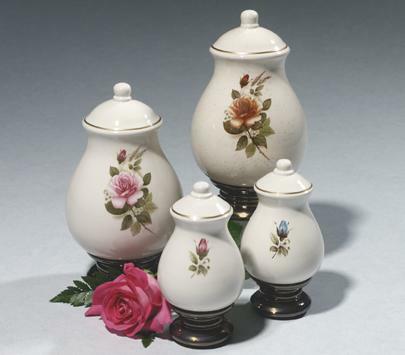 Beautiful fired-in rose applique brings a victorian tone to mind in this production cast ceramic* urn with bronzetone base. You may choose from Sienna, Pink or Blue rose applique. Also available in a small size. Large: 5" Dia. x 8.25"H, 45 cu. in.